How to get started (for new members), help to profile Vitae resources on your site and use our Tweet sheet. See our Vitae member benefits list for details of other ways you can benefit and member discounts. While much of our content for researchers is open, our newest and highest value content is available only to those from member organisations who register on our site. Our page lists premium content for researchers plus member-only content for PIs and supervisors and researcher development professionals. 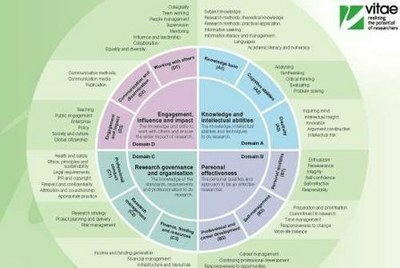 The RDF describes the knowledge and attributes of successful researchers. As well as being a useful tool for individuals planning and recording their professional development, it can be used by institutions to review, build and organise their professional development policies and support for researchers. Some of the resources designed to support RDF use are exclusive to members, including online development advice covering each of the 63 'descriptors'. Our supervising and managing researchers page gives an overview of materials that might interest academics in their role as managers and mentors to more junior researchers. Resources include guidance on having successful career conversations, supporting researchers through placements and short videos on mentoring research staff. Find more information and practical resources through our pages on supporting researchers' development and practical resources for researcher developers including the Vitae Career Framework for Researcher Developers. 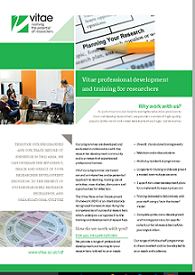 Highlights of what Vitae offers to support you in your role include our ready-to-use training packages, our Connections events programme and resources to introduce new doctoral candidates to Vitae and promote professional development planning. Also, check out our latest professional development and training for researchers leaflet to see the wealth of courses available. 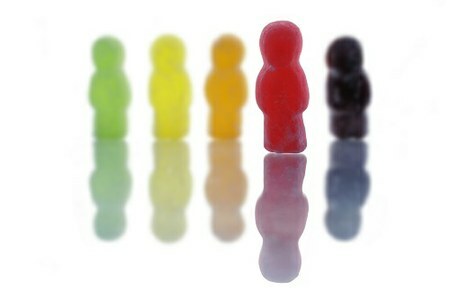 Networking with colleagues at other member organisations is one of the benefits of Vitae membership. Read more about ways we can support this. The best way to point your researchers to advice and resources from vitae is to link to them from your website! And find more in our RDF 'about' and RDF resources sections.